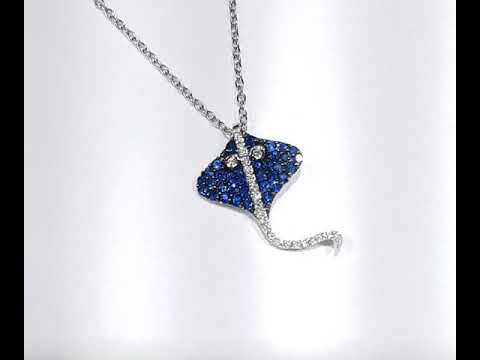 14K WHTIE GOLD ?BLUE SAPPHIRE STING RAY WITH DIAMONDS. DIAMONDS .23 SAPPHIRES .80CTS. .So what does a sapphire symbolize today? Many sources list that sapphires are believed to symbolize wisdom, virtue, good fortune, and holiness for royals. In an engagement ring, a sapphire means faithfulness and sincerity, too. We wish to believe it all but its all up to your personal prespective. We welcome you to come try out this beautiful Sapphire piece. Chains included for an extra cost.